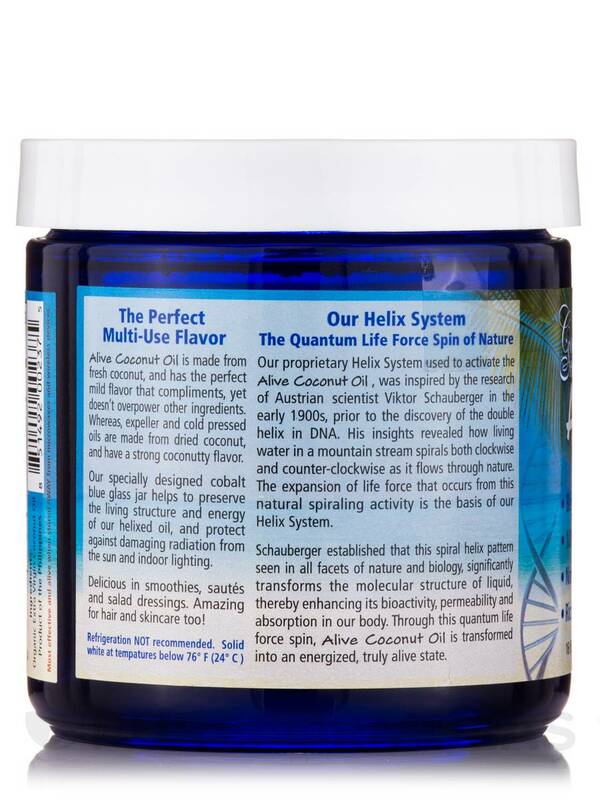 Made with Coconut Secret's exclusive Helix System®! Coconut Oil is one of the true superfoods of all time! Considered to be a healthy saturated fat‚ it is one of the only stable oils that can withstand extreme temperature ranges without oxidizing. Abundant in nutrients and Medium Chain Triglycerides (MCTs)‚ coconut oil stimulates metabolism to help burn stored fat‚ providing an instant source of energy without putting a strain on digestion. The MCTs in coconut oil assist in slowing down the entry of sugar into the bloodstream‚ thus helping to regulate insulin response in the body. Coconut oil has no trans-fats‚ contains antimicrobial healing properties‚ and helps to support overall immune system functions. Alive Coconut Oil is made from fresh coconut‚ and has the perfect mild flavor that compliments‚ yet doesn't overpower other ingredients. 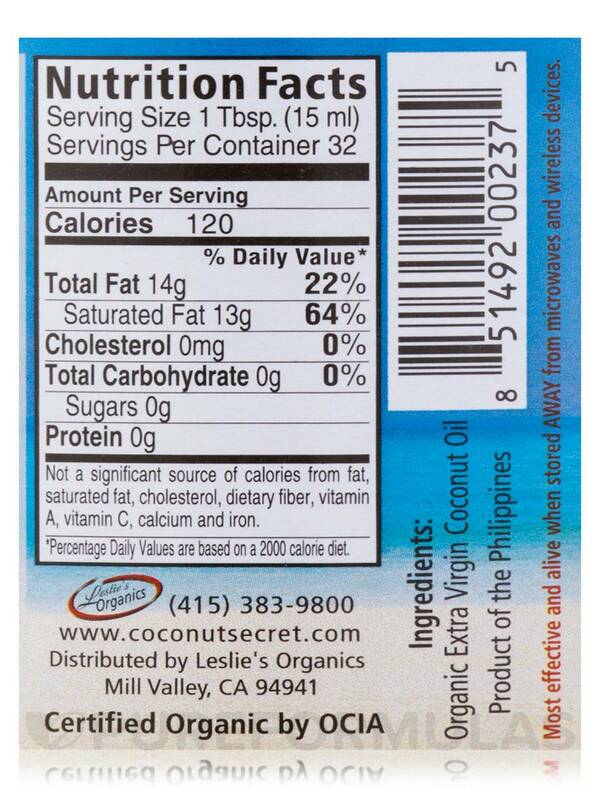 Whereas‚ expeller and cold pressed oils are made from dried coconut‚ and have a strong coconuty flavor. 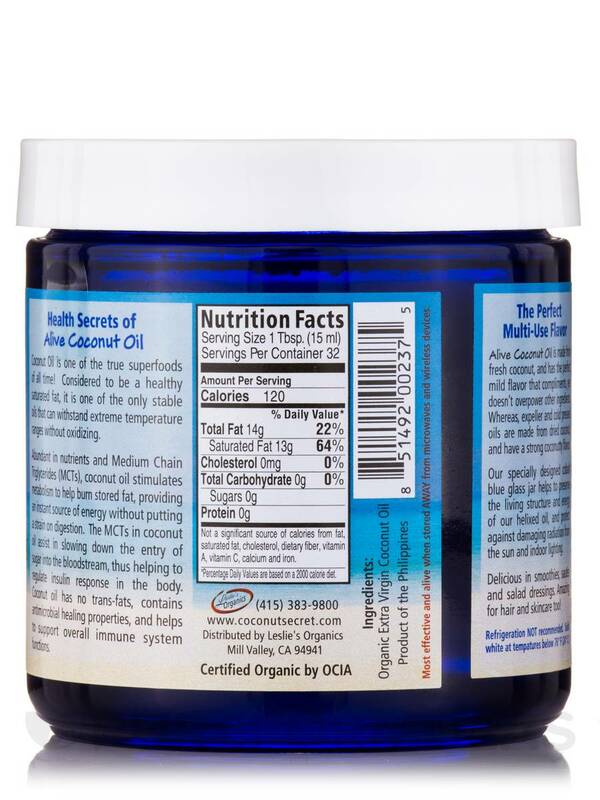 This specially designed cobalt blue glass jar helps to preserve the living structure and energy of the helixed oil‚ and protect against damaging radiation from the sun and indoor lighting. Delicious in smoothies‚ sautes and salad dressings. Amazing for hair and skin-care too! This proprietary Helix System used to activate the Alive Coconut Oil‚ was inspired by the research of Austrain scientist Viktor Schauberger in the early 1900s‚ prior to the discovery of the double helix in DNA. His insights revealed how living water in a mountain stream spirals both clockwise and counter-clockwise as it flows through nature. The expansion of life force that occurs from this natural spiraling activity is the basis of the Helix System. Schauberger established that this spiral helix pattern seen in all facets of nature and biology‚ significantly transforms the molecular structure of liquid‚ thereby enhancing its bioactivity‚ permeability and absorption in our body. 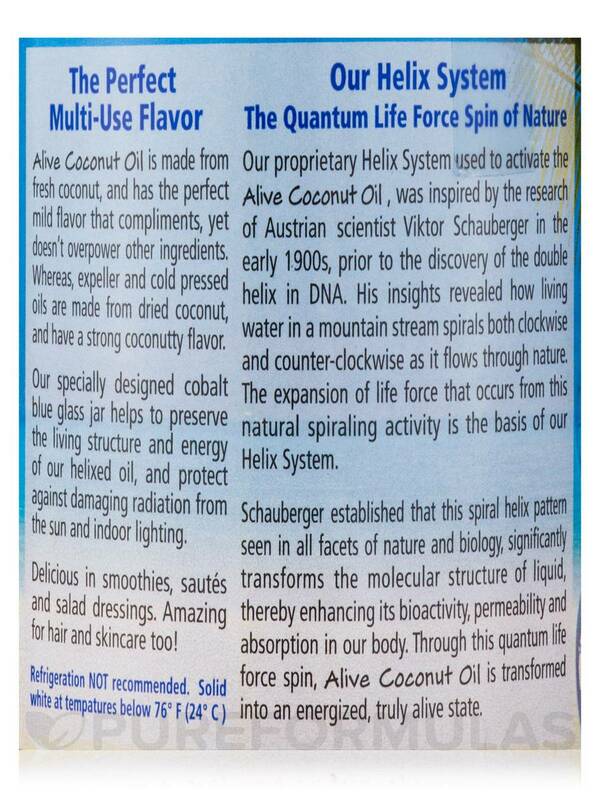 Through this quantum life force spin‚ Alive Coconut Oil is transformed into an energized‚ truly alive state. Not a significant source of calories from fat‚ saturated fat‚ cholesterol‚ dietary fiber‚ Vitamin A‚ Vitamin C‚ calcium and iron. Ingredients: Organic Extra virgin coconut oil. USDA Organic / Non-GMO Project Verified / Gluten-Free / Kosher. Delicious in smoothies‚ sautes and salad dressings. Amazing for hair and skin-care too! Most effective and alive when stored away from microwaves and wireless devices. Refrigeration not recommended. Solid white at temperatures below 76° F (24° C). I use Alive Coconut Oil by Coconut Secret primarily for making skin ointments, body butters etc. It absorbs and leaves the skin protected and with a satin feel, not greasy. 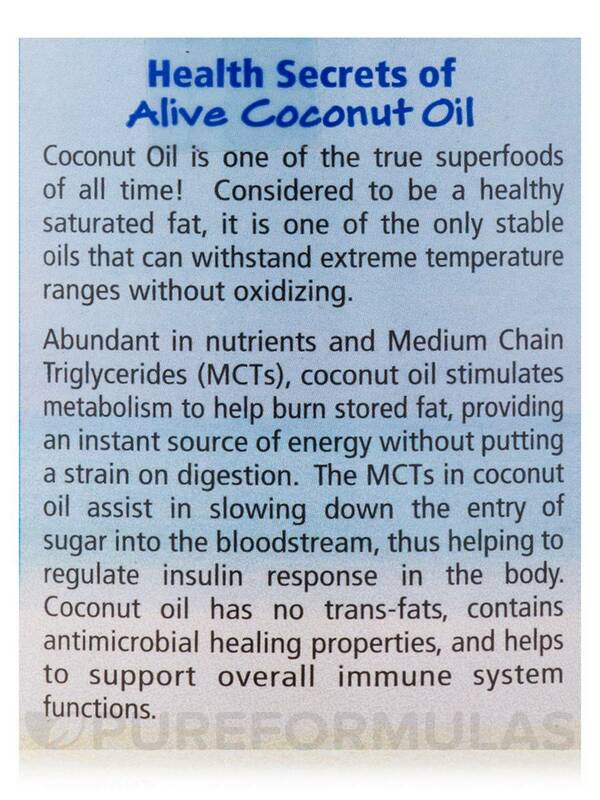 I have used most all of the organic raw coconut oils available and none preform like this one. I've used it exclusively since I discovered it. It really is special! It sinks into the skin, leaving the skin satin smooth, and protected. The smell is spot on, a light fresh coconut fragrance as in nature. Love Alive Coconut Oil by Coconut Secret! Smell texture and the blue jar! Lol. 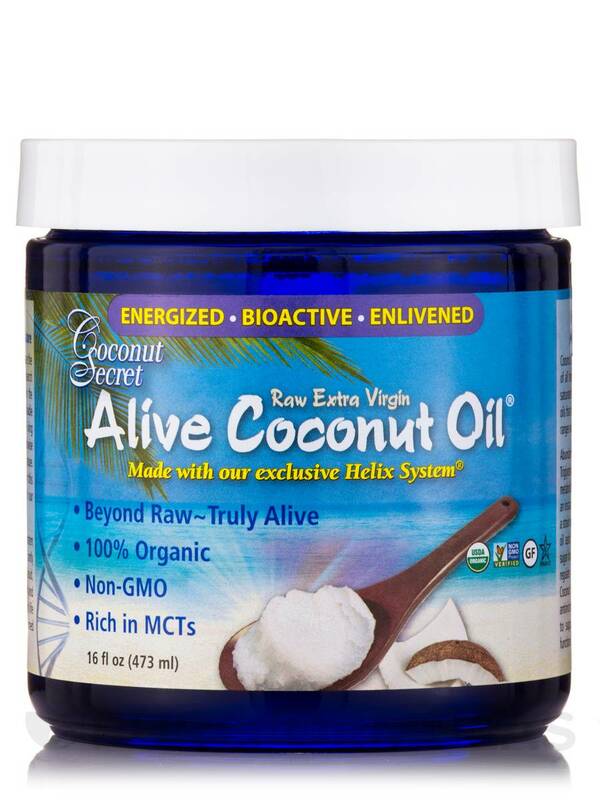 Alive Coconut Oil by Coconut Secret is a pure coconut oil. It taste great and it is great to use on your skin. I ordered Alive Coconut Oil by Coconut Secret acually out of curiosity and this has to be the best coconut oil I've ever used! I cook with it, use it in my morning smoothie drink and am using it as a face and skin moisturizer. I'll definitely be ordering again! I am intrigued with the processing benefit for highest quality health benefits. 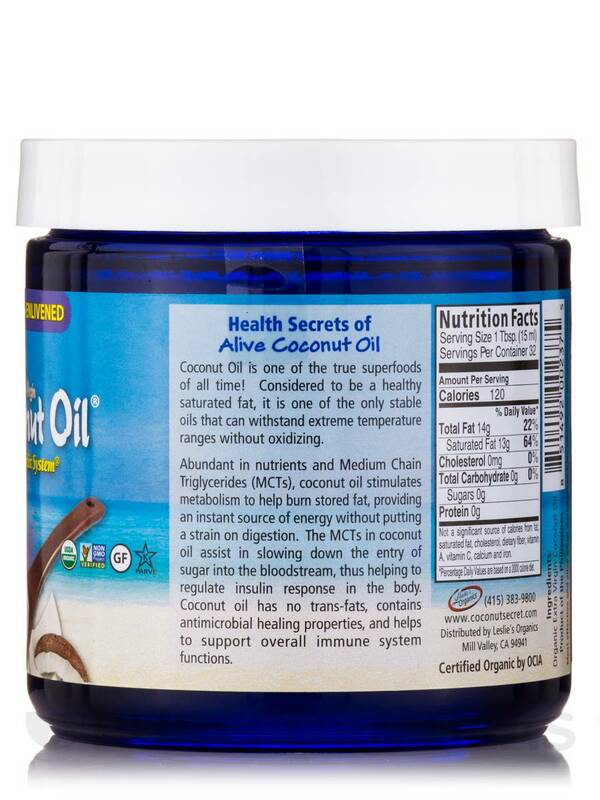 Alive Coconut Oil by Coconut Secret is amazing non GMO,organic with lots of benefits! There are too many brands offering the coconut oil these days but this particular one rates very high in my own ranking system and I highly recommend it to everyone. I actually have two questions. First, is the container for the alive coconut oil plastic or glass? If it is plastic, is it bpa and hexane free?